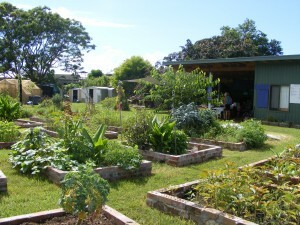 Members, their guests and visitors are most welcome to attend the Coffs Regional Community Garden during its open hours. These are currently Tuesday and Thursday from 9.00am to 3.30pm and Sunday from 10am to 4.30 pm. Our small livestock such as (Chickens, Muscovy ducks, Jap quails, Rabbits, Guinea pigs and fish). Alternately you can join in with the working bee that’s in progress at the time you arrive, this could be any combination of gardening and animal care work. Another option is just to have a leisurely wander around, enjoy the peaceful ambience and just hang out with a cuppa. Anyone can become a member of the CRCG simply by asking for a membership form, having the garden management system explained to you and paying your membership fee. Another membership option is to apply for your own private plot. The CRCG has 26 of these available for members to lease for their own special gardening experience. As a member you are eligible to join any of the interest groups or “pods” within the garden. These include ‘Media and Promotion’, ‘ Grants writing’, ‘Catering’, ‘Nursery ‘, Garden Maintenance’, Aquaponics’, ‘Animal Care or the ‘Flowers and beautification’ group. The CRCG is entirely based exclusively upon Organic production principles including promoting natural predator organisms, extensive plant diversity, onsite nutrient recycling through composting, worm farms, liquid fertilizers and the management of our productive animals. All produce from the garden is shared amongst the members that help with the maintenance and care of the garden. All seeds used in our nursery are non hybrid and most are own saved varieties. Members of CRCG have access to our nursery which contains a great range of edible and useful plants that you won’t commonly find in retail nurseries and at prices you won’t beat elsewhere. So we hope to see you at the eastern end of the Combine St Reserve in Coffs harbour to see the many features of what is now one of the very best community gardens in NSW and Australia. Print article This entry was posted by CRCG on February 13, 2015 at 11:36 am, and is filed under Community Gardening. Follow any responses to this post through RSS 2.0. Responses are currently closed, but you can trackback from your own site.